I wanted to start this story with the introduction of the potato to Europe around 1570 from Spanish explorers returning from South America, but it actually starts a bit earlier than that. This story begins in 1517 when Martin Luther, a German monk, released his “Ninety-Five Theses on the Power and Efficacy of Indulgences,” which question the Catholic Church’s practice of selling indulgences. He then supposedly posted it on the door of All Saints’ Church in Wittenberg. That was the catalyst of the Protestant revolution which would eventually lead to the death and persecution of millions of people in the name of a man who taught love, peace, tolerance and forgiveness. During the early 1500s, much of northern Europe, including what is now Great Britain, became under the control of Protestants. King Henry VIII was largely responsible for transforming England from a Catholic country to a Protestant one. Ireland, on the other hand, remained mostly Catholic and Henry worried that allegiances might be formed with that of Catholic Europe, such as Spain. Thus began a policy of “Plantations,” where land was confiscated from Catholic Irish and given to soldiers and colonists (Planters) of England and Scotland. This changed the demography of Ireland, especially in the north, by creating communities that were mostly Protestant British. These plantations started out slowly but increased as Irish resistance to British occupation increased. This culminated in the “Nine Years War” between the forces of the Gaelic Irish chieftains and of England. It nearly bankrupted England but in the end, the Irish lost. A few years later in 1609, the Plantation of Ulster by Scottish Presbyterians began on a large scale. The war kept the British troops occupied until 1649 when Parliament prevailed and King Charles I had been executed. By August of that year, Oliver Cromwell landed near Dublin, with an army of battle-hardened soldiers. Cromwell had a hatred for the Irish and considered them nothing more than savages. Under his command, many were brutally massacred at Drogheda and Wexford. After the massacres, many towns feared Cromwell and quickly surrendered while others feared what would happen if they did surrender. By 1653, the country was devastated and as much as 25 percent of the population was dead. In 1652 Parliament passed the “Act for the Settlement of Ireland,” which was supposed to punish participants in the Irish rebellion but was really designed to relieve the Irish of their land ownership and put it in British hands. Many of the Irish were forced into less fertile lands. Other laws were also passed by the late 1600s that denied most Irish Catholics many rights, including the right to own land or to hold office. Some of those rights were restored by the early 1800s but by then the damage was done. By the 1800s, most Irish Catholics were tenant farmers. They leased small plots of land from which to feed themselves and earn enough to pay the rent. They grew crops to sell and they grew potatoes to eat because potatoes were easy to grow in Ireland and they provided more calories per acre than any other crop. During this time the population of Ireland grew to over 8,000,000 by 1841. In 1845, blight hit the potato crops in Ireland. One-third to one-half of the crops were lost. This blight also hit crops in many other countries but no other society had become so dependent on the potato for survival. A Relief Commission was established to set up local relief committees composed of landowners, clergy, magistrates, and others. The committees were supposed to organize employment projects and distribute food. They were also tasked with raising money to cover half of the cost and the British government would cover the other half. Nothing went as planned as many of the committees were run by poorly educated farmers who could not get the land owners to donate any money. The British government appointed Charles Edward Trevelyan, Assistant Secretary of the British Treasury, to oversee relief operations in Ireland. Trevelyan was a micro manager and managed every detail of the operation. In the spring of 1846, he set up a large scale public works project that was supposed to help the unemployed but it was so burdened with bureaucratic red tape that it only resulted in anger and confusion. Other attempts to relieve the Irish were made by the British but all failed just as miserably. By the summer of that year, British Prime Minister Sir Robert Peel’s government had fallen and was replaced by the Liberals, also known as the Whigs. They believed in the principle of laissez-faire, a theory that opposed government intervention in business affairs, believing the free market would naturally take care of things. This might have worked except the market was not free for the Irish. They were held down by laws that made it nearly impossible for them to compete under British law. In 1782-83, Ireland experienced a famine and ports were closed to keep Irish-grown food in Ireland. No such port closures happened this time. Throughout the famine, Ireland was exporting enormous quantities of food. The country was producing and exporting more than enough grain crops to feed the population, but those were considered “money crops” and weren’t interfered with. The government, through the Irish poor laws, opened workhouses that were little more than death camps. Worse, in order to get into a workhouse, one had to give up any rights to property they might have. Landlords at the time were responsible for paying the rates, or poor taxes, of all tenants whose yearly rent was £4 or less. That meant that Landlords whose land was mostly poor tenants were faced with large bills. They began clearing the poor tenants and by 1847 there was a great mass of evictions. Getting the farmers to leave their land was not always easy and the landlords soon discovered that it was cheaper for them to book passage for their tenants on ships leaving the country. Many ships in the 1840s were importing lumber from Canada and were happy to get paid to ferry people on the return trip, for a price. The conditions on these ships were deplorable and became known as coffin ships because as many as a third of the passengers died on the trip across the Atlantic. 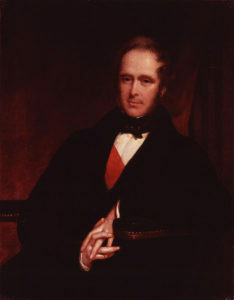 Henry John Temple, 3rd Viscount Palmerston, twice served as British Prime Minister starting in 1855. In 1847 he was Foreign Minister and owned land in Sligo and elsewhere. He was one of the first landlords to carry out what some call “forced emigration.” Whether forced or not, people at that time were starving and desperate and would have probably welcomed the opportunity to leave the country. In October of that year, 177 tenants of Lord Palmerston’s estate boarded a ship, along with 300 other Irish immigrants, called the “Lord Ashburton.” 107 people died during the trip and 87 had to be clothed by charity groups before they could disembark. Earlier that year, if what I have learned so far is true, my great, great, great grandparents, Felix O’Rafferty and Helen (McCormick) O’Rafferty were tenants of Lord Palmerston in Sligo. They boarded a ship heading to Quebec called the Carricks on April 5, 1847, along with their eight children, including sixteen-year-old Eliza, My great, great grandmother. The Carricks was a 242 ton brig built in 1812. It was a two-mast ship, 86 feet long and 26 wide. It was bound for Québec City under the command of Capt. R. Thompson. Aboard were 176 tenant farmers and 20 crew members. On April 28, a storm forced the ship onto the rocks, less than four miles from Cap-des-Rosiers, where it broke apart and sunk. Of the passengers, only 48 survived, including, incredibly, all ten of my family. Of the crew, one boy lost his life. The voyage and subsequent wreck must have been very hard on everyone, especially Helen who died a few weeks later. Eliza went on to marry Patrick Blake, who became an undertaker in Detroit after the Civil War. His funeral home business grew to be one of the most successful in the country. By the end of the Potato Famine, 25 percent of the population was gone; half from starvation and disease, the other half from emigration. Surprisingly, the population of Ireland continued to decline for over a hundred more years, reaching only 2.8 million inhabitants by 1961. The story of the Carricks is true but I have not been able to confirm that my ancestors were on the ship. The timeline seems right but passenger records were destroyed in in a fire in Quebec in 1865. Other names I have come across do not include O’Rafferty. In any case, the fact that they survived the famine is a story worth telling, especially since I am here to tell the story. This entry was posted in Uncategorized and tagged 1847, carricks, Irish potato famine, Lord Palmerston, Quebec, Sligo on September 17, 2015 by Chuck Huss.